This clever recycling bin is designed to fit paper grocery sacks. With this clever bin, recycling isn't just in the bag—it's in the paper bag. 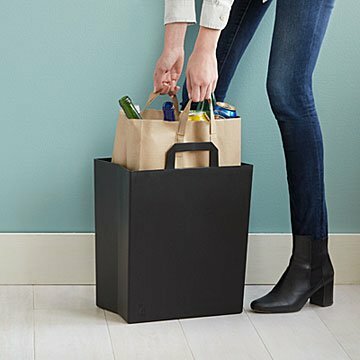 Available in classic black or white, the bin's shell is made from 100% recycled plastic and is just the right size to fit a paper grocery sack. Unlike plastic grocery bags, which can't typically be processed by city recycling programs, when this paper sack is full, you can pull it out and drop the whole thing off for recycling. Made in Vermont. I bought this for myself because I have been keeping my recycle in a paper bag on the floor for years. I've been trying to find a solution and then happened across this simple idea. It is perfect! I read other reviews about it being shorter than the paper bag, but it fits mine perfectly and it looks so neat and tidy. I love it - it was a good purchase! Description was a little misleading in that this product is a few inches shorter than a standard grocery bag; it even came with a few stubby versions of the bags you get at the grocery store. But I don't line it with a bag so I don't care that it's short. I love the fact that you can keep changing out the paper bag to keep the bin itself clean and that it looks so stylish in my kitchen. A place for everything and trash in its proper place. We used to keep recycling in a cardboard box with a paper bag in it. Thought this would be more visually appealing than the cardboard box. It's cute, but I wish it was a bit talker to cover more of the paper bag. The paper bags we get at the grocery store are much taller than the ones they sent with the bin. I like the recycling bin a lot. It's attractive and does the job it's intended for. I wanted to love the recycling bin but there were just a couple of minor details that keep me from it which is why I only gave it 4 stars instead of 5. It has the indent/crease on the sides so it makes it difficult to pop out the sides on the paper bag for it to stay open because when you put the paper bag inside the bin, the indent on the bin pop the crease on the bag so it folds back in. It needs straight sides. Also, I would have preferred that it actually be taller than the paper grocery bag so you couldn't see the bag, only the bin. Smart and attractive solution to an unceasing pile if paper. I have the white version. Very spiffy. i was tired of having a paper bag sitting in the corner of my kitchen for recycling. This container is the perfect solution!